Hedgehogs are not naturally offensive or aggressive to either perceived or real dangers. Instead, they are instinctively defensive, because their primary concern in life is survival! Hedgehogs are shy and can easily feel threatened when confronted with something new, different, or startling in their environment. A hedgehog will not attack like a dog does when it feels threatened, but would rather hide until the danger goes away. 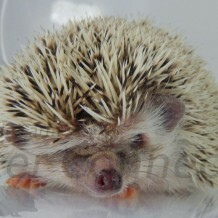 Most breeders try to continually breed for increasingly friendly hedgehogs. When mildly threatened or startled, a hedgehog will simply lower its visor or the spines on its forehead to protect its eyes. The hedgehog’s most obvious defense is to curl up in a ball and use its spines to protect its head and vulnerable underbelly. Huffing or puffing is the hedgehog’s way to ward off potential harm by appearing more threatening than it really is. Hedgehogs can click or pop as a way to poke human hands or any other critters that aren’t intimidated by the huffing and puffing. A hedgehog that feels threatened might use its visor or forehead spines to ram or lunge into something and poke it. This behavior may hurt but is not typically harmful to humans and is more unusual than normal. Hedgehogs can bite, but biting is usually attributed to other reasons (see the Biting Articles for more details).